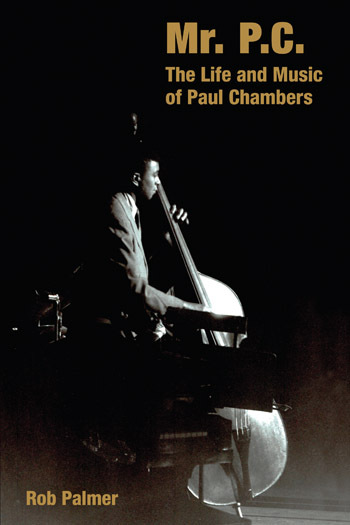 During his thirteen year career, between 1955 and 1968, Paul Chambers was one of the leading double bass players in jazz, performing with a variety of artists and in a range of the music’s sub-genres. He recorded over three hundred LPs for labels such as Blue Note, Riverside, Mercury and Columbia Records. Chambers performed as a sideman with many of the greatest names in jazz including Miles Davis, John Coltrane, Cannonball Adderley, Sonny Rollins, Wes Montgomery, Joe Henderson, Bill Evans, Wayne Shorter, Herbie Hancock, Hank Mobley, Lee Morgan, Gil Evans and Freddie Hubbard. He recorded a half dozen albums under his own name that included his own compositions, but is probably best remembered for his contribution to the greatest jazz recording of all time: Miles Davis’ Kind Of Blue. Mr. P.C. tells the story of this quiet giant of jazz: his early experiences in Detroit, his rise to jazz celebrity, his time at the top, his ultimate struggle against the tides of change enveloping the music that he loved, and the circumstances surrounding his tragic death, aged 33, in 1969. Featuring interviews with family members, friends and colleagues with the jazz fraternity, this book represents the first time that much of this influential musician’s story has been told. It includes a comprehensive discography detailing all of his recordings both as a sideman and a band leader. Paul Chambers and his instrument in the jazz pantheon, then this is it. Fellow bassist Rob Palmer has taken Chambers as a primary subject for his book and treated us to an exhaustive account of the great bassist’s life and music. Palmer gives us insightful reviews of the sounds made in many record dates in which Chambers participated. As a jazz musician, the author is able to provide his readers with technical accounts of the music on these recordings, not just the subjective impressions that could come from a typical jazz journalist. His work also sports a huge discography, which by itself is worth the price of the book. This book should prove indispensable to students of jazz bass, historians of modern jazz, and fans who love hard bop. It constitutes a reference work that every music library should have.